· Does not allow taking manual snapshot. The DIAGNOSTIC pack includes AWR, ADDM etc. 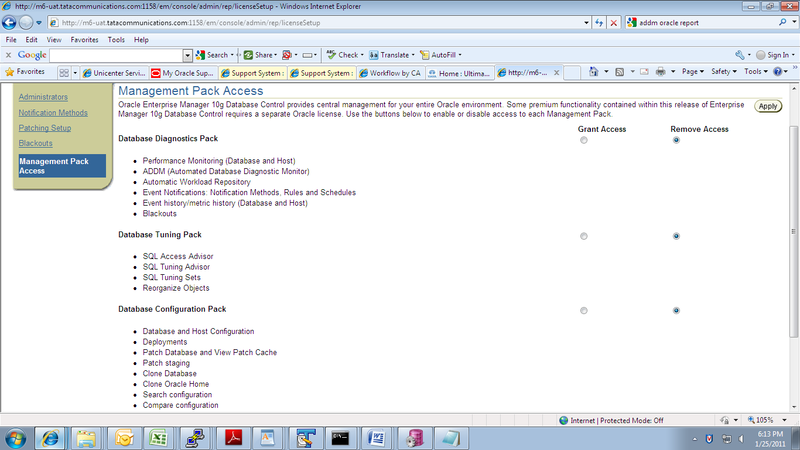 The TUNING pack includes SQL Tuning Advisor, SQL Access Advisor etc. A license for DIAGNOSTIC is required for enabling the TUNING pack. Both packs are not available. Only the DIAGNOSTIC pack is available. Both packs are available. This is the default. ORA-13716: Diagnostic Package License is needed for using this feature.